In a similar vein as last week’s maple pecan shortbread squares, this week I decided to continue my sugar rampage using a classic tangy dessert with a flavorful twist. 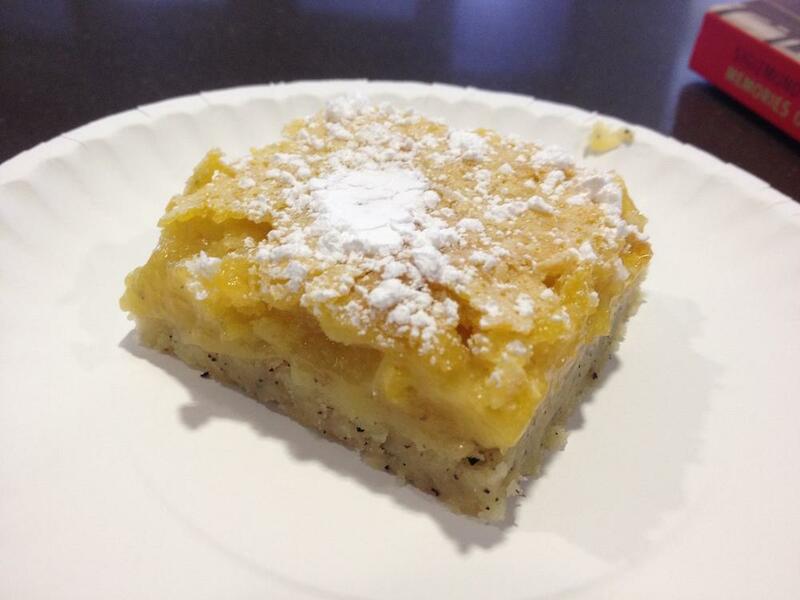 I took over the kitchen in Allison Hall to make scrumptious lemon-Earl Grey bars. To prepare crust, line an 8-inch square metal baking pan with foil that extends 2 inches beyond sides and coat foil with cooking spray. Combine flour, powdered sugar, 1 teaspoon tea leaves from 1 tea bag (discard remaining tea in bag) and salt in a bowl. Cut in butter with a pastry blender or two knives until mixture resembles coarse meal. You can also just melt the butter and add it, but it will be a little harder to spread along the bottom of the pan. Press into bottom of prepared pan. Bake for 19 minutes or until lightly browned. To prepare filling, place juice in a medium microwave-safe bowl. Microwave on high for 30 seconds. Add remaining 1 tea bag to juice, cover and steep 10 minutes. Squeeze juice from tea bag into bowl and discard tea bag. Combine granulated sugar, flour and baking powder in a bowl. Add rind and eggs to juice and stir with a whisk until combined. Add sugar mixture to juice mixture and stir with a whisk until well combined. Remove crust from oven and pour filling onto hot crust. Bake for 23 minutes or until set (As far as I’m concerned, “set” means that you can slide out the oven rack and shimmy the pan around without the contents moving). Cool in pan on a wire rack for 30 minutes. Remove from pan by lifting foil. Remove foil and cut into 16 bars. Sprinkle bars with powdered sugar.